often prove to be the most fasciantingn ones of all. In many traditional texts, the “redcoats” and “rebels” of the American Revolution are portrayed as having been generally disconnected from each other or otherwise connected by only the most unpleasant interaction. However, the colonial relationship with the mother country linked many unlikely individuals through ties of blood and affection, making the revolution to come an extremely heart-wrenching experience. A good example is the story of British officer Thomas Gage, who courted the beautiful, ambitious, and independent-minded Margaret Kemble of New Jersey during the French and Indian War. He was a guest at the Kemble home in the winter of 1757, and even though he was less than dashing and could be excessively “by-the-book”, she admired his gentlemanly nature and perseverance in his chosen career. Hence, the two were married in 1758. Gage was appointed governor of Montreal not long after. He proved to be a competent administrator, dealing with various details of municipal governance and military occupation. He passed practical laws for daily living, such as forbidding livestock from roaming the streets and enforcing carriage speed limits. In addition, the Anglican Gage had to establish good relations with the predominantly Catholic population of which he tended to be highly suspicious. This prejudice on his part may have been particularly intense because the Gage family had once been one of the staunchest Catholic families in England, right up to the point when Thomas Gage’s father converted to Anglicanism to prevent his prized racing horses from being confiscated by the government! Gage always seemed to go the extra mile to distance himself from his family’s rather embarrassing religious past, especially since both of his parents were reconciled to Catholicism before their deaths. Despite his anti-Catholicism, however, he came to be respected by the citizens of Montreal because of his basic integrity. America and transferred to New York. This placed him and his vivacious wife at the center of a vibrant social life that had been nonexistent in dreary Montreal. They were noted as being an exceptionally close couple, appearing in public together routinely and raising a large family of eleven children. They had many influential guests, including George Washington, who was one of the first visitors to their New York home. Both Gage and Washington had gone through their baptism of fire at the Battle of the Monongahela in 1755. The former was remembered for unintentionally entangling the British columns in the midst of an ambush, while the latter was remembered for heroically trying to rally the fleeing soldiers. But Washington also had some less than sterling moments in his early career, and both men were evidently familiar with having to explain themselves for good intentions gone awry. Based on these shared experiences, they developed a cordial relationship. In addition to Washington, Gage had befriended colonial officer Israel Putnam during the war with France. Putnam, like Gage, was sociable and seemed to have a knack for connecting with future enemies and their families. When the energetic young British officer, Lord George Augustus Howe, was mortally wounded in a skirmish in 1758, Putnam held him in his arms as he died. Everyone grieved the loss of Howe who was known as a brave and amiable commander. Unlike many other upper-crust British commanders who treated Americans with snobbish contempt, Lord George respected the colonials and was eager to learn everything he could from them. Some have stipulated that if he had lived into the years of the Revolution, he might have been able to defusing the volatile situation before it erupted. From 1765 onward, tensions rose in response to various direct taxes passed by Parliament on the American colonies. Gage’s efforts to enforce the unpopular laws caused many of the citizens of New York to turn against him, resulting in riots. He was then forced to bring in troops which restored some sense of order. After the Boston Tea Party, punitive measures were enacted by the British government, shutting down Boston Harbor and putting the city under martial law. They also decided to transfer Gage to Boston as military governor of Massachusetts, hoping that his steady demeanor would help quell the hotbed of revolt. This made Margaret Gage feel increasingly uneasy at the thought of her husband subjugating her fellow Americans. Apparently, Gage didn’t realize how deep her sympathies went and continued to confide in her, personally and militarily. Meanwhile, Gage learned that Israel Putnam planned on joining the American rebels and tried to persuade him to take a position in the British service. Putnam courteously refused. The Battles of Lexington and Concord were brought about by Gage’s order for the British troops to confiscate a cache of weapons and ammunition held by the American rebels. These unexpected skirmishes turned the “cold war” into a fiery hot one. But Gage had an even more pressing matter to deal with. Circumstantial evidence led him to believe that his wife had given information about British military movements to the American rebels. Her betrayal of his confidence was emotionally crushing for him. When the Americans dug in on the hills surrounding Boston, Gage acted aggressively and impulsively. He ordered Breeds Hill (later mistaken for Bunker Hill) to be taken by storm. The result was a pyrrhic victory for the British. The casualties were enormous, inflicted by the orders of Gage’s old acquaintance, General Israel Putnam, who ordered his American soldiers not to fire on the British “until you see the whites of their eyes.” In a twist of irony, General William Howe, the younger brother of Lord George, was the leader of the second British assault. To further prove that the bonds of friendships often transcend war, Putnam sent General Gage a cut of beef to prevent his household from going hungry during the siege of Boston under the leadership of General George Washington, commander-in-chief of the Continental Army. 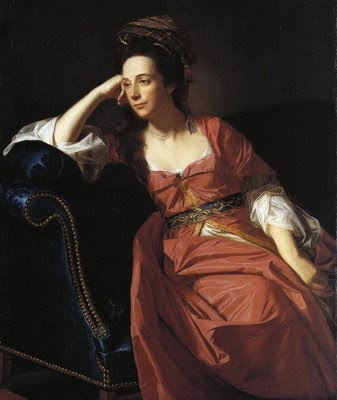 Desperate to conceal that his wife was a potential spy, Gage had her shipped back to Britain in order to silence the circulating rumors and keep his family out of harms way. This left him alone in Boston, the brunt of crude ditties accusing him of taking to drinking, a broken man with defeat looming. King George III tried to save his pride by ordering him back to Britain to “discuss future plans”, but everyone knew the real reason for his recall. His colonial titles were stripped, and some even suggested he be court-martialed for the debacle at Bunker Hill and the military secrets revealed under his watch. Apparently Margaret Kemble was a shrewd deal-maker, since none of her husband’s lands in America were confiscated during the Revolution. 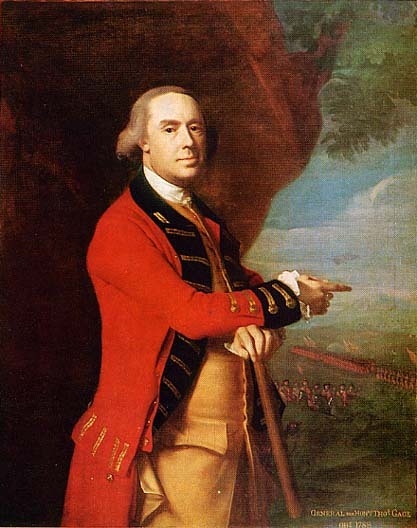 Thomas Gage was later given the job of mobilizing troops to repel a possible French invasion of Britain in 1781. The invasion never materialized, but Gage was given the rank of full general a year later. After an extended illness, he died in 1787. His wife Margaret survived him by 37 years but never remarried. Their story divided loyalties and enduring friendships stands out as a poignant example of the heartbreak that often accompanied the personal lives of those who took part in the struggle of the American Revolution. Some years ago I visited Concord and was greatly moved by the graves of (I think) three Redcoats who were the first to fall. Fresh flowers were placed there regularly. It was much appreciated. Thank you for this narrative. Similarly, the Texas war for independence from Mexico was not a matter of two disparate cultures; many of the folks knew each other well and had married into each other's families. One wonders if the population within the province -- an example of Chesterton's distributism? -- could have sorted things out. The recent increase of Americans bringing a 'tude and slavery, which was forbidden by the Mexican constitution and the mass-murder pathology of Santa Anna made peace impossible.